Supercomputer developments are constantly opening their new application fields. Social simulations are expected to be one of the most exciting fields of their applications in coming decades, and various attempts are being made to renovate social sciences. To bring together current developments in applications of supercomputers to social sciences, a workshop entitled “Social Simulations and Supercomputers” was held on October 29, 2018 as a workshop session of the 21st International Conference on Principles and Practice of Multi-Agent Systems (PRIMA2018) at Tokyo Waterfront of Advanced Institute of Science and Technology (AIST), Japan. The workshop focused on the latest research activities connecting social simulations and supercomputers, covering modeling, implementation, data mining, applications, and so on. 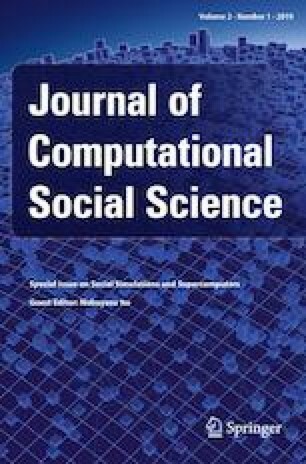 This issue of the Journal of Computational Social Science presents ten original, peer-reviewed papers selected from this workshop.